Operose – Involving or displaying much industry or effort; done with much labour. Discussion with Paul Brennan on Critical Mass today focussed on Macafee’s 12 scams of Christmas. I thought I knew better but a few weeks ago I thought an email was from my brother in Australia it wasn’t and contained a virus which, fortunately my computer picked up and quarantined. 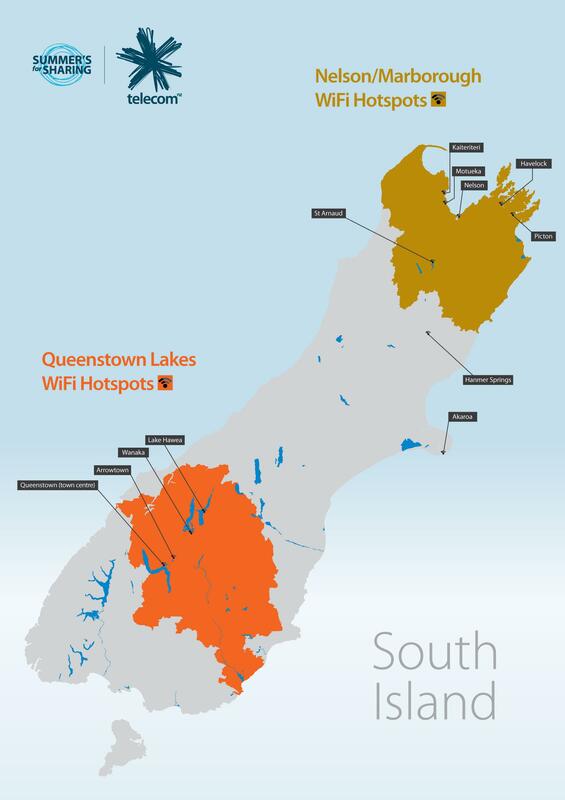 Telecom has installed more than 100 free WiFi ‘hotspot’ access points across popular summer regions throughout New Zealand (including Northland, the Coromandel, Bay of Plenty, Tasman and Queenstown Lakes. 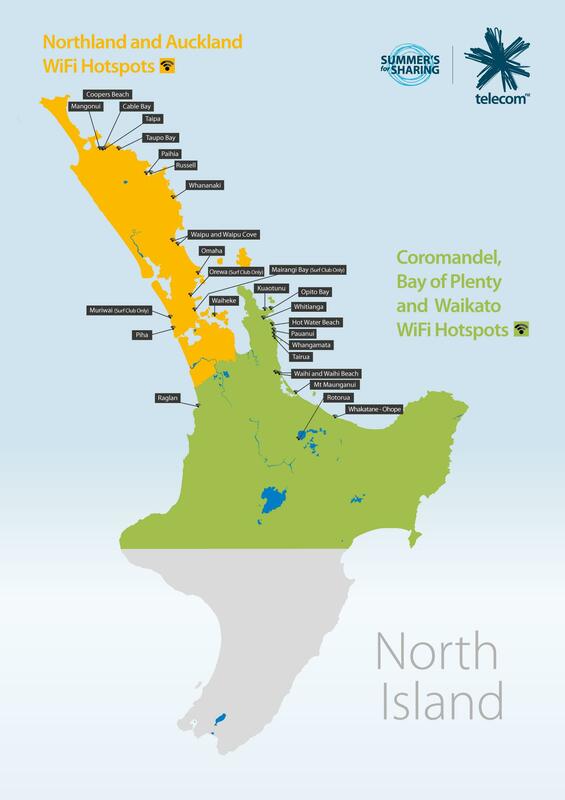 The free service goes live from 18 December 2012, so whether holidaymakers will be sunning themselves on Piha Beach in Auckland, or taking a stroll by Lake Wakatipu in Queenstown, they can rest easy knowing that they’re able to stay connected to friends across the country on their smartphones or laptop devices. . .
During the course of the summer, Telecom and ZM radio will host ‘Telecom WiFi Lounges’ in selected Telecom WiFi hotspots around the country with deck chairs and umbrellas to allow people to relax while they surf the net. Staff will be on hand to show people how to use the service so they can upload and share summer holiday pics with friends and family online. The company is activating the service through existing Telecom telephone boxes in the selected regions, and in some cases by building WiFi transmission into existing infrastructure such as surf clubs and local shops. Users will initially be taken through a short online registration process before their device automatically connects to the service each time thereafter. The company has also partnered with select Surf Life Saving clubs to deliver WiFi via selected surf clubs to beachgoers. And the partnership doesn’t end there. Telecom workers across the country are pledging their own support for the essential summer Surf Lifesaving services through payroll giving, and by encouraging fundraising through Givealittle, the online giving platform. More details, including a list of the hotspots, here. The Government’s economic plan to deliver a faster-growing economy, more jobs and a return to surplus remains on track, despite ongoing uncertainty in many parts of the world, Finance Minister Bill English says. Issuing the Half-Year Economic and Fiscal Update today, along with the Government’s Budget Policy Statement, he says Budget 2013 will focus on continuing to implement this plan. “We’ve set four main priorities for this term. “They include returning to surplus and reducing debt; pushing ahead with a wide-ranging programme of microeconomic reforms to create a more productive and competitive economy; driving better results from public services; and supporting the rebuilding of Christchurch. The Half-Year Update forecasts the Government posting a modest surplus of $66 million in 2014/15 – down from the $197 million surplus forecast in Budget 2012. It also shows net core Crown debt peaking below 30 per cent of GDP. The importance of this hasn’t yet got through to the opposition who have fought tooth and nail against every policy to control spending, even though it has been done without reducing services. Over each of the next five years, economic growth is forecast to average 2.5 per cent, together with increasing numbers of New Zealanders in employment and a falling unemployment rate. “The global economic environment remains uncertain and this makes it even more important to maintain clear and credible fiscal settings,” Mr English says. “This is a time for sensible and responsible policy – not for untried economic experiments. “Budget 2013 will confirm the Government’s commitment to responsible long-term fiscal management. “This will require restraint well beyond the surplus target of 2014/15, so we can pay down debt and build a buffer against the next global shock, while at the same time resuming payments to the New Zealand Superannuation Fund and targeting investment at priority public services. Opposition parties are much better at spending money than saving or making it – except of course Green co-leader Russel Norman who is very keen to just print some more. “At the same time as getting its own finances in order, the Government is continuing to address New Zealand’s significant economic challenges, including a sustained rebalancing towards the internationally competitive sectors of the economy. Looking ahead, the European sovereign debt crisis and ongoing fiscal debt problems in the United States are risks to the global recovery. Downgraded forecasts of global growth have been factored into the Half-Year Update. “Compared to many other countries, the New Zealand economy is in good shape,” Mr English says. “Despite our growth forecasts being slightly weaker than in Budget 2012, New Zealand is expected to grow more strongly over the next four years than the Euro area, the United Kingdom, Japan and Canada. “New Zealand has a number of positive opportunities over the next decade, including strong and growing trade and investment links with Asia, elevated terms of trade and the Christchurch rebuild – which is expected to contribute 0.7 per cent to annual growth over the next few years. The outlook isn’t for boom times, but sustained growth in the face of domestic and international challenges is no small achievement for the National-led government. It’s also one which we couldn’t hope to achieve with Labour-Green prescriptions.
. . . She was also charged with falsifying records and other misconduct. The Teachers Council has imposed a series of conditions on her returning to teaching and has censured her. The council said she had had serious health issues and both her parents had recently died. It says there is nothing to suggest her teaching ability is under question. There could well be a lot more to the story that the report shows. I hope there is and that is shows that character is taken into account when questioning teaching ability. Problem of numbers or distribution? If this decline in sperm counts is caused by environmental factors, then it can almost certainly be reversed eventually by doing enough research and then eliminating those factors. In the meantime, however, we are passing through the astounding total of seven billion humans beings, on our way to nine or 10 billion. That’s far too many for this finite planet, and a rapid decline in the birth rate, even to below replacement level, would be a good thing. But if there is a population problem, and that is debatable, is it one of number or distribution? Birth rates in few if any first world countries are high enough for replacement let alone growth. Hat tip: Tracey who left the link in Sunday’s Open Mic post. Sir Heny van der Heyden stepped down as chair of Fonterra at the company’s AGM yesterday. Taking stock of the changes within the industry over the past 10 -15 years, Sir Henry reflected on the important decisions that had strengthened Fonterra’s global position and returns to farmers. “It’s been one huge year after another and every one of them has made us stronger. “Together we’ve turned a collection of co-ops into the world’s top dairy exporter. “Creating Fonterra was a massive leap of faith on two levels. We put our faith in a single integrated model – and we put our faith in it succeeding in an entirely deregulated market. I can say without a shadow of a doubt that we pulled it off,” he said. “Fonterra came out of the blocks with $11.8 billion in assets. We have grown that by 28 per cent to $15 billion. That’s an outstanding performance. Sir Henry said global demand for dairy was the strongest it had ever been and was growing. Chief Executive Theo Spierings said since Fonterra’s formation in 2001, the Board and farmer shareholders had made the tough decisions required to position the Co-operative for growth. “Establishing a Fair Value Share, achieving a transparent Milk Price, and introducing a dividend policy were the first three hurdles. This year, Trading Among Farmers has delivered permanent share capital and a stable capital base. Maintain a balance between environmental, economic and social sustainability. Building a durable co-operative for the future meant Fonterra had to align spending, to make sure resources were directed to the right priorities, said Mr Spierings. Sir Henry said that when he took the job on, he wanted to make a difference and leave the Co-operative in a better position at the end of his tenure. He has done that and its not only shareholders who have benefited from that. Fonterra also makes a very significant contribution to New Zealand’s economy. Its milk in schools programme is beginning to make a valuable contribution to education and health. New chair John Wilson and the other incumbent director Nicola Shadbolt were re-elected to the board. The other vacancy was filled by former Shareholders’ Council chair Blue Read. You are currently browsing the Homepaddock blog archives for the day Tuesday, December 18th, 2012.